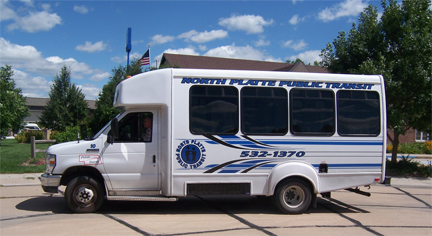 The North Platte Leisure Services Department sponsors the North Platte Public Transit System, our buses transport passengers to and from any location within the city limits and are available to everyone. Service is provided on a demand-response basis. The charge is now $3.00 per one-way ride, if you book your ride on the day you want to travel. When you book your ride at least 24 hours in advance, the charge is $1.50 one way. The “demand response” service that picks you up directly at your door. Call 532-1370 to schedule a ride! Bus tickets available, please see drivers for details. All public transit buses are equipped with wheelchair lifts. Give us a call at 308-532-1370 (at least 2 hours before you need us, or 24 hours in advance, when possible) and we will take you anywhere within the City of North Platte. You can reserve a ride with Public Transit up to seven days in advance. If for some reason you need to cancel your scheduled ride, please notify the dispatcher at least one hour before you are scheduled to be picked up. If you fail to cancel your ride, you will be charged a no show fee of $1.50. We ask that you start watching for the bus 45 minutes before your time to be at an appointment. (If you have a 10:00 appointment, start watching for the bus at 9:15). Please be ready to board the bus as soon as it arrives. Passengers must behave appropriately. We will not tolerate passengers who create a disturbance. The driver has the right to ask you to get off the bus if this would happen. Intoxicated passengers are not allowed on the bus. Tobacco use of any kind is not allowed. Animals must be on a leash and in full control of the handler. Please limit your shopping to eight bags per person. We are a door to door service. If you need assistance past the door, to carry your packages, or if you need assistance while riding the public transit, you may have an attendant ride with you at no charge. The driver will report any issues with personal hygiene problems to the Supervisor.